Drop off your parcels with our fast, free, convenient service. There’s no queuing, weighing or printing. And it’s available in 97% of Post Office branches. New to Drop & Go? Sign up online. Collect your prepaid Drop & Go card from the branch (you’ll need some ID). Top it up and start using it right away. Fill in a parcel manifest either online or by downloading our form to tell us which items you want to send. Find your local Drop & Go branch and drop off your items to the fast-track counter with your completed manifest. We’ll process them the same day. Already set up online access? If you already got online access to your Drop & Go account you can login here to access everything you need. Want online access to Drop & Go? If you already have a Drop & Go card and want to: top up, check account history, view tracking details and create manifests. If you sell online, we’ve got a few tips that can help you out. Read on to find out more. Handy links, extra information and related mails products. Who is Drop & Go for? It’s a fast, free service for anyone who sends lots of parcels. There’s no queuing, weighing or printing. So it’s ideal for anyone selling lots of items online, especially if you’re short on time. What ID do I need for a Drop & Go account? You’ll find a list of the documents we accept here. Or you can ask our mails specialist in branch. Why do I need an online account? Register your Drop & Go account online and you can top up the balance on your card, complete parcel manifests, track your items, view your account history and update your details any time. How easy is it to send a parcel with Drop & Go? It’s quick and easy to send parcels with Drop & Go. Once you’ve set up your account, log in to complete a parcels manifest with the items you want to send. Take it straight to the fast-drop counter in a Drop & Go branch with your items. We’ll deduct the cost from your prepaid card and process the parcels the same day. Can I drop Parcelforce Worldwide parcels at a Post Office branch? How do I find a parcel drop off point near me? 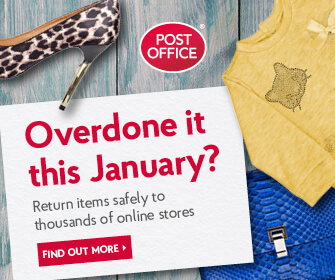 You’ll find a Drop & Go counter in 97% of Post Office branches. Use our Branch Finder to find the one nearest to you. When will branches accept my parcels? Parcel acceptance times vary by Drop & Go branch, so please check with the mails specialist in your local branch to find out local cut-off times. What if I have more questions about Drop & Go?